Australia, like much of the Western world, agreed soon after World War II to care for refugees in the 1951 Refugee Convention without regard or distinction based on race or religion. Despite this, some members of the government — most notably Immigration Minister Peter Dutton has gone on the record to say that it was a “mistake” for previous governments to accept Lebanese Muslim refugees. In his blog post, of which only 38% of the words are his own bona-fide original expression, he states that he hopes that none of the 5,662 non-Christian refugees selected by the United Nations are allowed to resettle in Australia. Of course, it is unconstitutional for the federal government to prohibit religious practice and it could easily be argued before the High Court that preferencing refugees of one religion over another constitutes such prohibition. 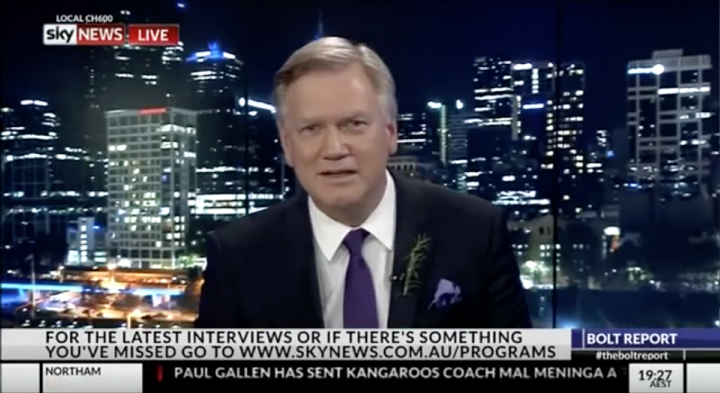 Without reading any of his other blog posts, it seems that Bolt genuinely believes that Christians are the most persecuted group in the Syrian conflict. (The comments seem to suggest this). While it is indisputable that Christians are being persecuted and their plight should not be ignored, it is simply dishonest to suggest that they are the biggest victims. Muslims, especially Shia and non-denominational Muslims, face (in terms of the number of casualties) far more violence. However, no comparison between the victims of this war should matter because ultimately no group of people is safe from the violence. It doesn’t seem to matter what religion or race a person is: if they are in Syria, they are a target. Of course, Bolt doesn’t seem to care care. I’m told that’s his schtick.